"Rugs can be such an important contribution towards the decorating of a home. 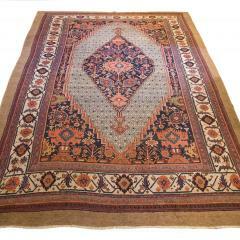 We represent period rugs that we believe complement our collection and yours. If there is a rug you are looking for and do not see, please call or email, we may not have cataloged it yet." 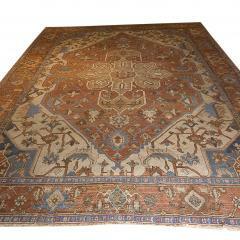 A beautiful rug with a large central medallion with navy, red, rose and white colors surrounded by a camel hair border. The center has a bronze floral patterned polychrome poled medallion inside a salmon stylized diamond medallion which is cross-thatched with blue vines intersecting floral creme colored buds. A rectangular creme colored field with with blue and salmon colored corners provide the background field which is surrounded by a blue and salmon polychrome floral border.